Could we have a little context? I checked the Bureau of Labor Statistics website which is the source of the 228,000 number and downloaded and plotted some history. Here is a short term monthly chart. 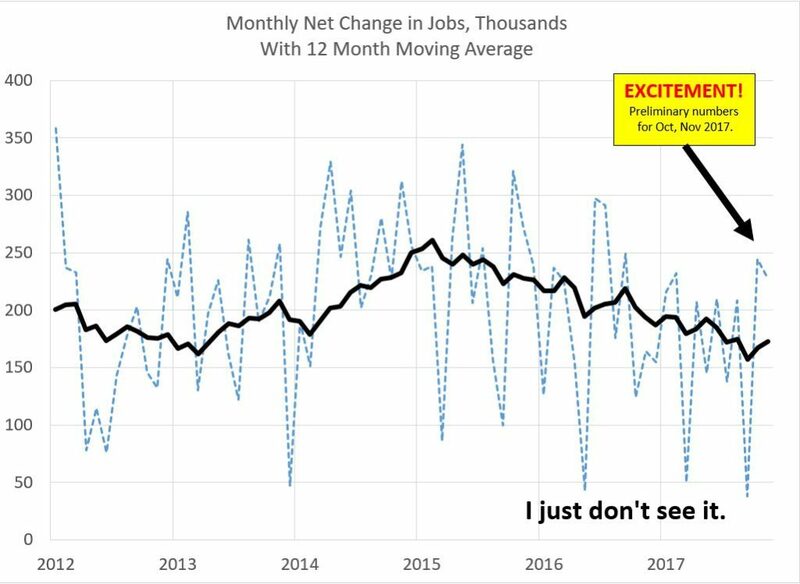 The key points are that there is a lot of noise in the data, that the most recent numbers are estimates and are likely to be revised, and the the 12 month moving average trend which removes much of the noise shows little to celebrate. In this context, I see nothing “robust” about the recent numbers. 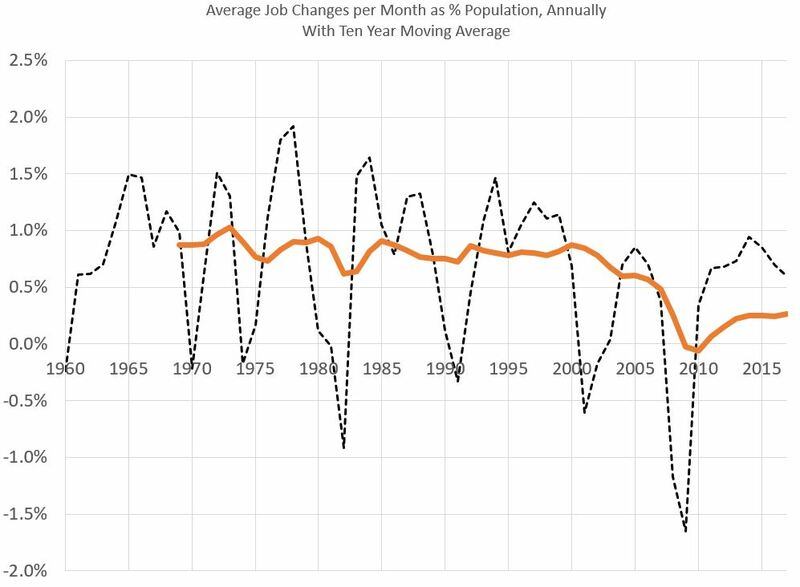 The picture is even worse if we take a long term look, since 1960, and put the results in terms of job growth as a percent of population. The gloomy fact is that we are in a ten year slump in job growth as a percent of the population and that the reported low unemployment rate of around 4% is possible only because so many have left the workforce. So, yes, we need serious tax reform to stimulate the economy. If that tax reform moves strongly in the direction of lower marginal rates with elimination of exemptions, deductions, exclusions, and credits, there is no reason it cannot generate more tax revenue immediately even as it stimulates the economy and job creation by attracting more investment. Whether the poorly designed mess currently proposed by the Republicans will be a move in the right direction is doubtful. Next Post Happy New Year. It’s Infrastructure Time! People leave the job market for government benefits. Maxing out can result in $60k equivalent income. Yes, there are systemic problems with employment that are not captured by unemployment statistics. Underemployment and figures for those who have given up have been the stuff of basic macroeconomic literature since I was in high school. What has been changing has been older people, particularly men, who have given up with no retirement or an unsustainably meager retirement income. Also, recently there have been various regional studies on disability rates wherein there are higher rates of disability. It will be interesting to find out why really why. I suspect part of it can be attributed to some combination of few opportunities, out of date job skills, health care to get well enough to work and/or stay at work, and that old conservative standby, “they are only interested in a career and not just a job.” The next step is to do something about it. More robust job training that is geared to getting more people in the labor market will be challenging and expensive. Substantial minimum wages will entice many to get back in the market. But there may be at least a slightly smaller number of economically bottom level jobs. The good thing about that would be the increased dignity of working people being on less or no public assistance. We have a shrinking pool of people in the labor market and that ought not to be ignored. I agree with your thoughts concerning the employment statistics. However, the currently proposed mess appears to me to be better than no proposal or any offered during the last twenty years.